“So it’s like a sponge?” a 17 year-old asks with a questioning look on her face. “Yes, that’s a perfect way to think of it,” replies Dwane Jones, director of the Center for Sustainable Development at the University of the District of Columbia. This interaction is typical of the exchanges that occurred over a 3-day introduction to green stormwater infrastructure (GSI) led by the Water Environment Federation (WEF; Alexandria, Va.) and local guests as part of the Green Zone Environmental Program (GZEP). 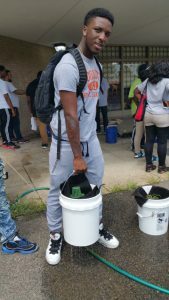 Since 2009, this program, which is held each summer by the Washington, D.C. Department of Energy and the Environment, has provided opportunities for adolescents and young adults from Washington, D.C., to gain hands-on experience in a variety of environmental sector jobs. The program exposes participants to a wide range of activities, such as installing solar panels, testing water quality, and planting trees. 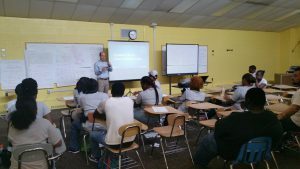 GZEP is one of the largest environmental youth work and training programs in the nation, with over 350 D.C. residents ranging from 14 to 24 years old engaging in environmental activities annually. The introduction to GSI led by WEF staff focused on the potential for job growth in the industry and future career opportunities associated with GSI investments in the D.C. area. This summer’s timely conversation was delivered against the backdrop of the recent launch of the National Green Infrastructure Certification Program (NGICP) by WEF and DC Water. NGICP, which will aim to award its first certifications in early 2017, verifies that would-be green infrastructure builders meet international best practice standards to ensure the sustainability of their projects. NGICP seeks to illuminate career paths and provide job portability for those interested in green infrastructure professions. Beyond career-focused discussions, WEF staff shared technical information on watershed health, water quality dynamics, and urban runoff generation. The instructors also shared basic GSI information, such as preferred materials and plantings commonly used in GSI practices and advice regarding construction and maintenance. The real value of the GZEP; however, is the hands-on aspects. The students group participated in a number of field exercises. For instance, one afternoon saw volunteers build “bioretention in a bucket.” Participants learned firsthand that bioretention facilities comprise multiple layers (sand, filter media, gravel bed, mulch, planting layer, etc. ), each of which plays a specific role to help retain and treat runoff. After an orientation from WEF staff and volunteers about the components of bioretention facilities, participants assembled their own small-scale versions. The exercise reinforced the educational messages about multiple layers playing specific roles. Another interactive session included a trip to the newly established East Capitol Urban Farm in Southeast D.C. This facility takes a unique approach to bringing fresh, locally grown foods to “food desert areas” where fresh produce can be difficult to find. During a tour of the 1.2-ha (3-ac) site, volunteers learned about raised-bed garden plots, rain barrels, and the large on-site bioretention facility that helps to control runoff. 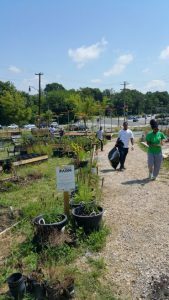 In addition to innovative water stewardship approaches, the Urban Farm hosts a “fish exchange” that allows D.C. residents to swap fish potentially contaminated with pollutants from the nearby Anacostia River for those raised on-site at the facility. The Urban Farm, which is built upon land leased from the D.C. government, also hosts the first farmers’ market in the neighborhood. During their visit, GZEP participants, WEF staff, and volunteers helped to weed plants, move and distribute mulch, and prepare planting beds. At the end of the 3-day program, participants had a better understanding of how urban runoff affects D.C., how GSI can help, and how GSI and stormwater management can enhance communities as well as career potential. GZEP administrators continued to gather valuable information about how to engage the next generation of water stewards. With the hands-on session under their belts today, this summer’s GZEP participants may well be the crucial green infrastructure technicians of tomorrow. Take a different look at how GZEP participants explore the future of energy. Find out how to get involved with GZEP. Seth Brown is principal and founder of Storm and Stream Solutions LLC (Alexandria, Va.).